The 2019 economic outlook is dominated by many of the same themes of a year ago. While fiscal stimulus (tax cuts and government spending) should provide support in the near term, labor market conditions will become more binding, Federal Reserve (Fed) policy is set to become tighter, and trade policy adds uncertainty. If the current economic expansion continues past June, it will become the longest expansionary period on record. So, many investors ask, when will the next recession occur? The likelihood of entering a recession, a period of declining economic activity, usually lasting two quarters or more, does not depend on the length of the expansion. That is, we are never “due” for a recession. There are few signs of a pending economic downturn on the immediate horizon, but economists have raised the odds of a recession beginning in late 2019 or 2020 – still not likely, but also not out of the question. The stage is typically set for a recession by a period of over-investment or mal-investment, often fueled by increased leverage. Fed policy is often a factor, typically by raising short-term interestrates too rapidly or by previously raising them too slowly (and then having to play catch-up). In past decades, sharp increases in oil prices were also a catalyst, dampening consumer spending. Every downturn has its own story. The Tax Cuts and Jobs Act of 2017 (TCJA) lowered the corporate tax rate and many economists remained doubtful of the impact it would have on the economy since firms were generally flush with cash and borrowing costs were low. Research has shown that corporate tax cuts are more likely to increase share buybacks and dividends than to fuel capital expenditures and, for the most part, that was the case in 2018. However, business fixed investment, while uneven from quarter to quarter, was generally stronger. The other component of the TCJA was reductions in personal tax rates, which will expand in early 2019. While the impact will vary across income levels and regions, overall consumer spending, which accounts for 68% of overall economic activity, should see a boost in the first half of the year as a result. The impact of fiscal stimulus will fade over time, but job gains and wage increases areexpected to drive consumer spending. 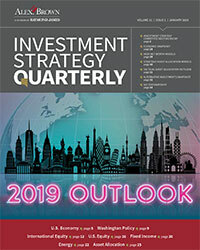 Read the full January 2019 Investment Strategy Quarterly.